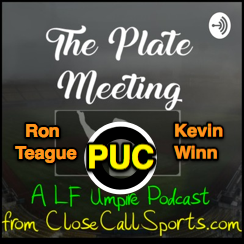 In this ninth episode of The Plate Meeting, a LF Umpire Podcast from CloseCallSports.com, we interview Ron Teague and Kevin Winn, American Association and CanAm umpire supervisors who attend the Pro Umpire Camp. 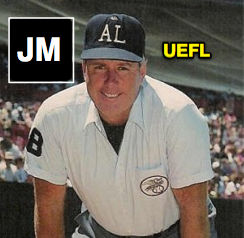 A former MiLB official, Ronnie Teague is the Director of Umpires for the American Association. While on the field of affiliated ball, Ron was the umpire who famously called two pace-of-play (batter's box violation) strikes to punch out a minor league batter and stood in for one of Joe Mikulik's patented temper tantrums. We talk about these plays and more on the show. Kevin Winn is the Executive Director for the Can-Am League, who several years ago saw an alumnus—Will Little—make it to the MLB level, the first CamAm product to crack the majors, followed shortly by fellow alum Adam Hamari. Winn was the Director of Umpires on duty who supervised Hamari and Little in the CanAm. Pro Umpire Camp (proumpirecamp.com) helps umpires gain experience as they advance in all levels of baseball from Little League to the Minor Leagues, offering classroom and on-field education and instruction regarding the three-umpire system, video analysis, and a chance to be seen by independent league decision-makers, including the American Association, CanAm, Atlantic, and Pecos Leagues. 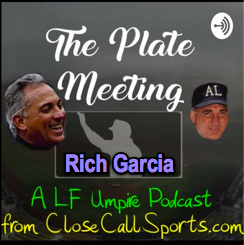 Click the below play (▶) button to listen to "Episode 9 - Pro Umpire Camp with Ron Teague and Kevin Winn" or visit the show online at https://anchor.fm/the-plate-meeting. The Plate Meeting is also available on iTunes (Apple Podcasts), Google, Spotify, Stitcher, TuneIn, and several other podcast apps. Alternate Link: Episode 9 - Pro Umpire Camp with Ron Teague and Kevin Winn. Related Link #1 (14:30): Minor Teague Ball: The One Pitch Strikeout and Ejection (8/4/13). Related Video #1 (14:30): Ron Teague ejects Vinnie Catricala after one-pitch SO in Texas. 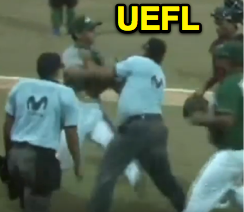 Related Link #2 (16:45): MiLB Ejection: Ron Teague (Joe Mikulik) (7/7/15). Related Link #3 (25:00): Featured MiLB Ejection - Ron Teague (2 Aces, 1st Inning) (4/19/16). As the last full-time full-time Canadian on the Major League staff until Stu Scheurwater's hiring in 2018 (British Columbia-raised MLB umpire Ian Lamplugh  was born in England), McKean received a slew of honours. He was inducted into the Canadian Hall of Fame in 2004, received the NDG Baseball (Montreal's version of Little League) Lifetime Achievement Award in 2015, and, most recently, entered the Florida State League Hall of Fame in November 2018. 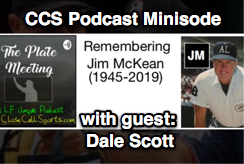 Related Post: Jim McKean Inducted into FSL Hall of Fame (11/13/18). McKean also officiated junior hockey and played in the Canadian Football League (quarterback/punter) in the mid-1960s, winning the CFL's Grey Cup with the championship Saskatchewan Roughriders in 1966. McKean (1945-2019) was 73 years old.